Make small balls by rolling about 1 heaping tablespoon of dough in the palm of your hand. Use the extra yuca flour to prevent the dough from sticking to your hands. Remove from oven and serve immediately piping hot. 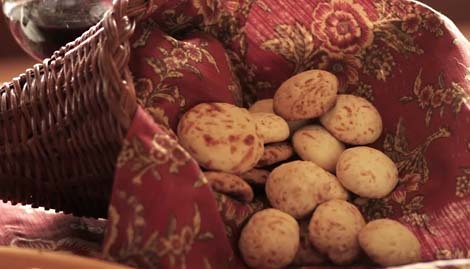 Known as the national treasure of Brazil, this cheese bread recipe is amazingly simply. Ellie adapted it from her mother’s recipe because we don’t have the same ingredients here in the US that are in Brazil. It has just three ingredients. Made with yuca flour, aka tapioca flour, they are gluten free. Ellie shared 3 tips with me - once they are in the oven, you cannot peek for 30 minutes or the rolls will collapse - so NO PEEKING!! Ellie also shared that they are best eaten hot out of the oven. And lastly, double or triple the recipe because one batch will get eaten before it even reaches the table!